Hurricane Harvey left behind untold numbers of demolished fields and cotton modules setting in mud amidst the devastation of homes and businesses in many farming communities. Total farm and ranch losses will take months to calculate. Topping off the bad news is cotton seed sprouting due to warm weather temperatures baking modules and wet, mature bolls that are still in the field. And, swatting an abundance of mosquitoes is not helping anyone's feelings. Crop insurance rules are confusing at best in this situation. There is a possibility that some growers may be forced to harvest what would otherwise be called unproductive fields. Gaylon Morgan, Texas A&M, recommends that growers keep a record of all damage just to be on the safe side. Thankfully, the Panhandle-South Plains area has a warm, clear weather forecast for the next 10 days, which will certainly help finish the late planted crop. New Mexico, Oklahoma and Arizona growers are looking at a good harvest potential. Armies of aphids are in the Lubbock area. Production costs will certainly go up if sprays are needed to avoid sticky cotton. It’s a balancing act between defoliation and growth conditions in central Texas where rain threw off the timing of PGR applications. Bacterial blight and verticillium wilt are spreading in West Texas. Clyde Crumley, Crumley Agricultural Consulting, El Campo, Texas: “We had a lot of 3 bale-plus cotton along the Colorado River that was flooded from the heavy rains brought by Harvey. I made boll counts before the storm and I’ve been a half-bale short on my estimates. Those fields appear unharvestable, but it will come down to what the insurance folks say. “We’re at Needville in Brazoria County this morning (9/5) to evaluate some fields. Some areas were not in creek bottoms, but still have water. Many fields had open bolls hit with combinations of high winds and driving rain. Some of them don’t look as bad as we thought. Bolls may look good, but the seed has sprouted. Those farmers will likely get no value for that seed, which normally pays for ginning. Josh McGinty, Texas A&M AgriLife Extension Agronomist, Corpus Christi: “Not a whole lot has changed from last week. We don’t have anything new on numbers of acres lost. The South Texas Cotton and Grain Association estimate of about 225,000 possible acres lost are still as close as we’ve come. “The weather has been pretty good. When fields completely dry up, guys will be able to harvest. I talked to a county agent in Cuero where they had defoliated just before Harvey hit. It’s like a lot of the Upper Coast crop – about 60 to 70% of it is on the ground and what’s left in not in good shape. “Most remaining cotton has sprouted, which means farmers will have to pay ginning costs out of their pocket. But for insurance purposes, they will probably have to run through it with a picker and harvest what they can. There may not be many pounds per acre but they may get something out of it. with mud from Hurricane Harvey flooding. Photo: Clyde Crumley, Crumley Agricultural Consulting. Gaylon Morgan, Texas A&M AgriLife State Cotton Specialist, College Station: “In the Brazos Bottom things are drying out except for lower lying areas. Some fields that were under water will see plant staining. There is not that much lint lying on the ground, but guys will lose seed quality. “Defoliants are going out now and will continue this week. Guys are going to have to get more aggressive due to more regrowth on plants caused by the heavy rain. 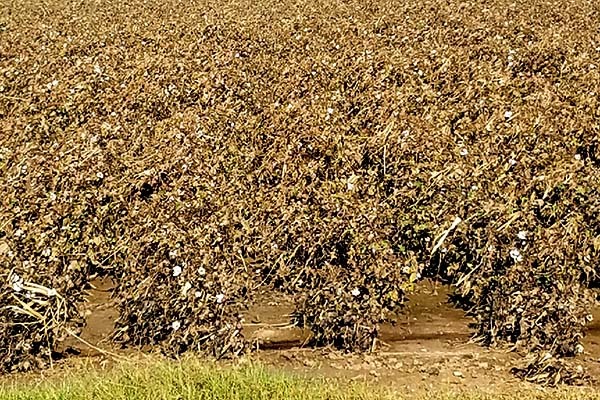 “It’s a mixed bag for Upper Coast damaged cotton – ranging from failed crop to still soaking wet all the way to fields worth harvesting. There’s still a question about round modules that got wet. There will be different levels of wetness and a lot of those are going through a heating process, which is not good. They are basically rotting on the inside and seed is sprouting. “We still have no idea on the percentage of crop losses. I’ve talked to numerous ginners on the status of damaged modules. All the information is pretty vague. There are not a lot of specific answers for growers. “Obviously crop insurance will play into what happens next. Growers need to document everything they can on damage to their farms, including round modules and how many are damaged and going through the heating cycle. John Robinson, Texas A&M AgriLife Extension economist/cotton marketing specialist, College Station: “Things are still up in the air on losses caused by Hurricane Harvey and the tremendous flooding. I’ve heard a half-million bales tossed around. Those 400,000 lost bales I’ve discussed (last week) don’t take into account the modules lost or damaged. Xandra Morris, Texas A&M AgriLife IPM Agent, Hill & McLennan Counties: “We’re pretty much wrapping up. Some growers have defoliated and a lot more will be on it this week. Defoliation needs vary from field to field based on plant growth caused by our big rains in August. A lot of the plants are way too tall. Everyone had to apply PGRs, but too much rain hurt the timing. So growers may need more defoliant applications to penetrate into the canopy. Mark Hatley, Crop Quest Consulting, Dumas, Texas: “We can’t complain up here in the northern Panhandle. We would like some more heat for a little longer, but that’s all we’re anxious about in order to get this crop matured. Cotton is in the late-bloom, boll-fill stage. A lot of it is at cutout. If we get it matured, it will be one of the best crops we’ve ever had. Seth Byrd, Texas A&M AgriLife Extension Cotton Specialist, Lubbock: “Our forecast looks better for good growing conditions. The overnight lows aren’t great in the low 60s, but we have highs in the upper 80s and low 90s, which is good because we’re still trying to make cotton. Clear sunny days will benefit a lot of fields. Some areas could still use rain. Counties farther south of Lubbock are still getting some irrigation. Randy Norton, University of Arizona Extension Cotton Specialist, Safford: “We’re coming down to the very end. It has been warm, which helps with defoliation and finishing the crop out. Very little has been defoliated in central Arizona but fields are getting close. Some of that cotton is still showing signs of heat stress from earlier this summer. “We’re headed back to Yuma today (9/5) to harvest more plots. Trials we harvested last week picked about 2,100 pounds per acre. A lot of cotton picked around Yuma is in the 3.5 to 4-bale range. The eastern part of the state looks good and is setting up for a nice harvest. Both upland and Pima look good. “Some isolated pockets of insecticide treatments going out. There are reports of the cotton leaf perforator in some fields, but I’m not recommending farmers go in and do anything this far into the crop. But, if you have whitefly issues, that’s something you don’t want to let go. This is the worst time to have whiteflies. We don’t want sticky cotton. I’m not aware of any situations, but it’s just a word of caution. Katelyn Kowles, Texas A&M AgriLife IPM Agent, Lubbock & Crosby Counties: “We’re seeing a lot of pest pressure. I’d say 100% of the fields I see have cotton aphids. Farmers are telling me they haven’t had this type of issue with aphids since the early 90s. "A lot of cotton aphids crashed after being at threshold of 50 per leaf. Now they’re at 10 aphids per leaf or more. But when bolls crack, lower populations can cause sticky cotton. If they don’t crash when bolls are opening, farmers may need to spray. “Cool weather hasn’t stopped cotton aphids or sugarcane aphids in sorghum. A lot of guys are spraying for sugarcane aphids at all stages of sorghum growth. Further complicating things are headworms and fall armyworms in sorghum. There aren’t many good options for spraying. Farmers may have to choose which insects to spray as it relates to their production program. Tyler Mays, Texas A&M AgriLife IPM Agent, Terry, Yoakum & Gaines Counties: “There’s not a lot happening. We’re still picking up a few bollworms. We had a few farmers start spraying for bollworm in conventional cotton a few weeks ago. I’m seeing aphids, but nothing to the magnitude they have in Lubbock County area. If we’re at open bolls in a few weeks, we could see sticky cotton issues if we have aphids. But we’re still well below the 50 aphids per leaf threshold. “I’m finally seeing all our fields at cutout. Some late cotton down south was slow to mature. It became really growthy, which led to a longer bloom period than we would like. Verticillium wilt and bacterial blight are also showing up so we’re monitoring those fields to be better prepared for next year. Tommy Doederlein, Texas A&M AgriLife IPM Agent, Dawson County: “Early planted cotton is looking pretty good. Most is past cutout and several fields have open bolls and cracked bolls at the bottom. But if it was planted late, it’s still going to be questionable what your yield might be. Those fields are healthy and developing fine but they’re just so late – some are still at 6 to 7 NAWF. We need that good, long open fall to pull some of this cotton through and get an average type harvest. Shane Osborne, Agronomist, Western Equipment Co., Altus, Oklahoma: “Our crop looks good. It’s a good ending to a rough start. Several growers have commented they may have a better crop this year than last year, which was a great one, but that’s not widespread. We will have some really good dryland and really good irrigated cotton, but there are some pockets of dry areas that are closer to average. “We’re still fighting off a few late season insects but we’re in good shape, all in all. “Growers have done a good job with weed control. With the new technologies out there, we haven’t experienced the level of problems that are getting publicized in other areas. “Our guys have done an admirable job.